The Autorefractor Keratometer Topographer Tomey RT-7000 is a all-in-one unit. Patients are able to receive a comprehensive inspection without the hassle of moving from station to station. With one touch the RT 7000 is able to quickly switch from Ref-Kerato mode to Corneal Topography mode as the light cone appears from the measuring head and the Ref-Keratometer is transformed to Topographer. 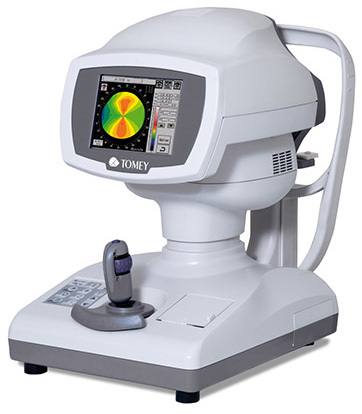 The Touch Alignment of the Autorefractor Keratometer Topographer Tomey RT-7000 quickly aligns the eye cener with the center of the screen by simply touching the eye shown on the screen. The Auto Alignment and Auto Shot functions then start measurement immediately. Two CCD cameras capture images for observation and measurement while also providing accurate measurement data. The viewing angle of the fixation target is wider to help patients feel relaxed during the process. Are you done with the Autorefractor Keratometer Topographer Tomey RT-7000 ? Go to Autorefractors.